The 2017 National Medal recipients, represented by the institution’s director and community member, celebrate their awards after the National Medal Ceremony, held at the National Archive on July 17, 2017. Since 1994, 172 institutions received the National Medal, the nation’s highest honor for museum and library for service to their communities. Photo credit: Gediyon Kifle. Joined by noted journalist Cokie Roberts and the tenth Archivist of the United States, David S. Ferriero, Matthew presented the 2017 National Medal to 10 museums and libraries that have demonstrated extraordinary service and dedication to their communities. Each 2017 winner was joined by a community member who shared a personal story about how the winning institution has contributed to their life. The following institutions and their community members’ stories are a testament to the work and service of these institutions. 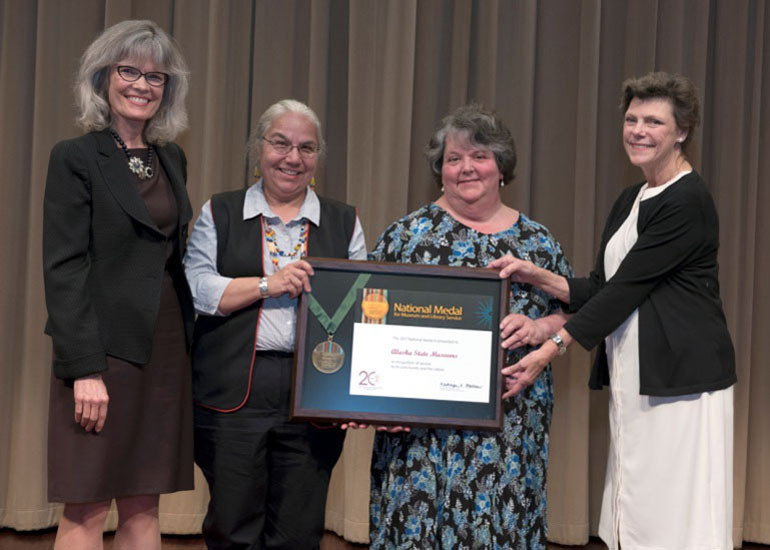 Institute of Museum and Library Services Director, Dr. Kathryn K. Matthew, (left) and journalist Cokie Roberts (right) present the National Medal for Museum and Library Service to Patience Frederiksen, director, Division of Libraries, Archives and Museums at the Alaska State Museums, (third from left) and community member Lani Hotch (second from left). Photo Credit: Gediyon Kifle. Founded in 1900, the Alaska State Museums is the third-largest museum in the state and serves as a flagship institution, keeper of state history, and a mentor to small community institutions in Alaska, like the Jilkaat Kwaan Heritage Center in Klukwan. Lani Hotch, the center’s executive director, notes that the Alaska State Museums supported Klukwan as they developed the center, training staff in museum operation basics, the proper handling of artifacts, and providing input on exhibition construction and design. The training and support the community received from the Alaska State Museums helped establish the center and ensure that the tribe’s cultural artifacts and stories will be preserved well into the future. 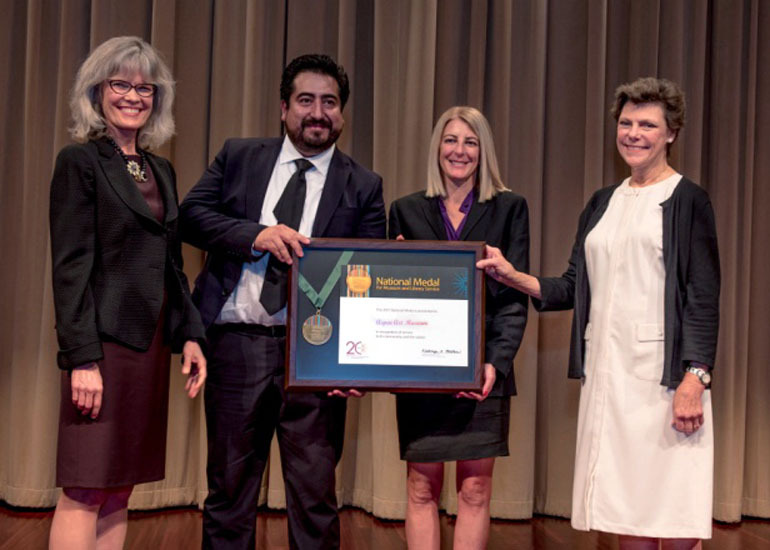 Institute of Museum and Library Services Director, Dr. Kathryn K. Matthew, (left) and journalist Cokie Roberts (right) present the National Medal for Museum and Library Service to the Aspen Art Museum’s CEO and Director Heidi Zuckerman (third from left) and community member Samuel Bernal (second from left). Photo Credit: Gediyon Kifle. One of four accredited art museums in Colorado and the only accredited art museum in Colorado’s Western Slope, the Aspen Art Museum is also the state’s first museum to receive the National Medal. Committed to serving the region’s diverse population and unique geography, the museum uses arts programming to make meaningful connections with the community, including the prevalent Hispanic population. Community member Samuel Bernal, who runs the Spanish-language radio station La Tricolor 107.1, collaborated with the museum to create the Arte en Espanol program, tailoring its reach to the Hispanic population in the rural valley. With his help, the events draw in hundreds of participants who previously had no connection with the museum. Personally, Bernal has embraced the museum with great energy and enthusiasm, sending photos of exhibits to his daughter in Mexico to facilitate their discussions on contemporary art. 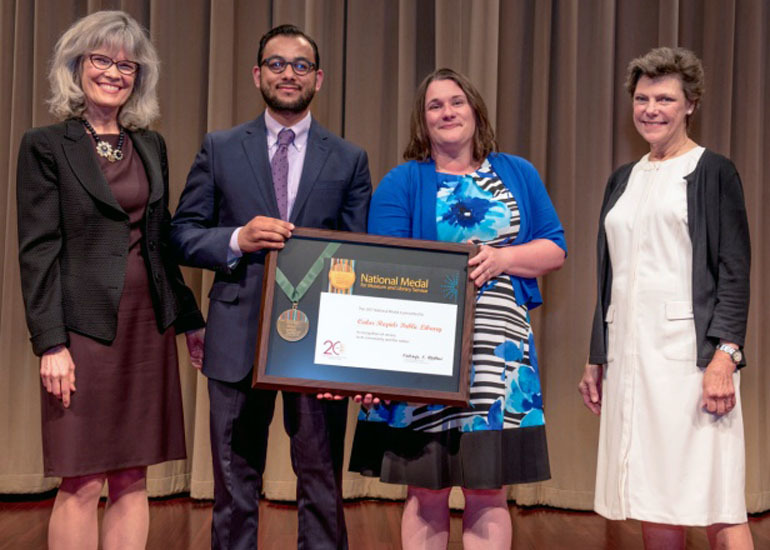 Cedar Rapids community member Hassan Selim (second from left) and Dara Schmidt, director of the Cedar Rapids Public Library, celebrate after accepting the National Medal for Museum and Library Service from Institute of Museum and Library Services Director, Dr. Kathryn K. Matthew, (left) and journalist Cokie Roberts (right). Photo Credit: Gediyon Kifle. Since 1897, the Cedar Rapids Public Library has created a culture of awareness of the importance of literacy, never leaving a person behind in its endeavor to encourage lifelong readers. The library’s programs reflect the needs of its community, fostering successful partnerships that build community trust. Growing up in Egypt, where Western books were often banned, Hassan Selim was not exposed to the concept of a public library. After immigrating to the United States, Selim became a library regular and his love for the library grew. Today, Selim serves as a library advocate and as a board member of the Library Foundation. Now a U.S. citizen, Selim says the library epitomizes the access to ideas that allow people to grow and find success. 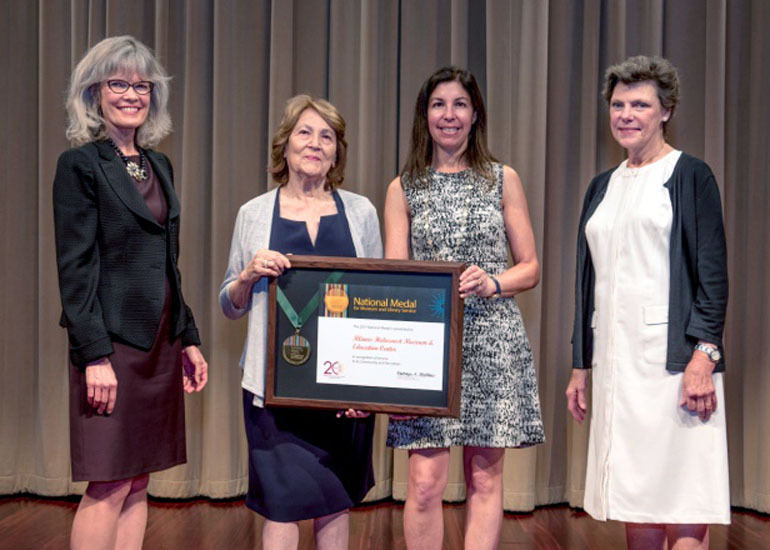 Institute of Museum and Library Services Director, Dr. Kathryn K. Matthew, (left) and journalist Cokie Roberts (right) present the National Medal for Museum and Library Service to Illinois Holocaust Museum & Education Center at the National Archives. Susan L. Abrams, CEO of the Illinois Holocaust Museum & Education Center, (third from left) and community member Fritzie Fritzshall (second from left) accepted the award on behalf of the museum. Photo Credit: Gediyon Kifle. The Illinois Holocaust Museum & Education Center of Skokie, Illinois, uses a powerful network of volunteers and survivors to encourage all who come through its doors to enact change. Community member Fritzie Fritzshall is a true believer in the museum’s mission. For much of her life, Fritzshall kept her personal Holocaust experiences hidden away. It wasn’t until she united with Holocaust survivors like herself that she kept her promise to the 599 women living with her at an Auschwitz labor camp—that she would tell their stories. Today, she is an active member of the survivor community, serving as president of the museum’s board. She reflects that while earlier she hated the color yellow that reminded her of the Yellow Star of David patch she was forced to wear, yellow now reminds her of the many school buses filled with children that come to the museum to learn about the power of change. 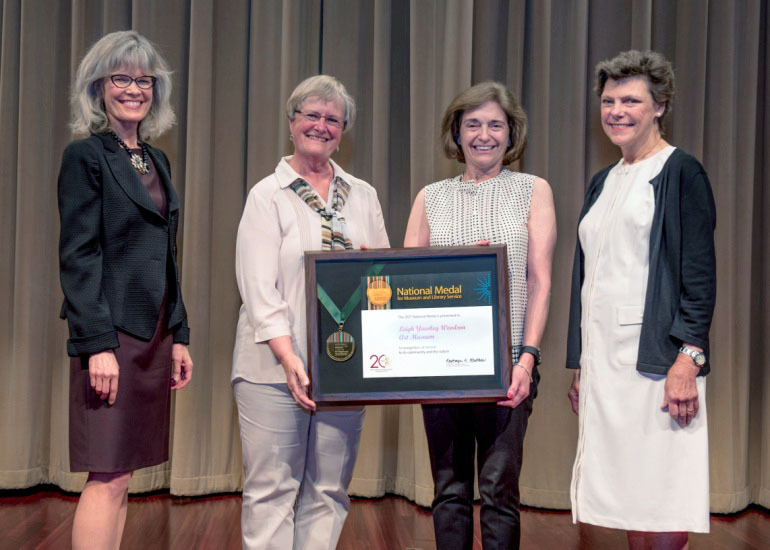 Leigh Yawkey Woodson Art Museum Director Kathy Kelsey Foley (second from right) and community member Linda Haney (second from left) accept the National Medal for Museum and Library Service from Institute of Museum and Library Services Director, Dr. Kathryn K. Matthew, (left) and journalist Cokie Roberts (right) during a ceremony at the National Archives. Photo Credit: Gediyon Kifle. Tucked away in the majestic woodlands of Wisconsin, the Leigh Yawkey Woodson Art Museum is a regional treasure. The 41-year-old museum commits itself to barrier-free access and remains steadfast in its mission to enhance lives through art. Docent Linda Haney’s life was enriched by the museum after she retired to Wausau, Wisconsin. Through the museum, Haney saw an opportunity to enhance other lives through art, adding a new dimension to her life as well. She now participates in all museum programs, leads the Head Start preschool students through art experiences, and joins other patrons on organized trips across the country. Today, Haney is an art enthusiast, which she credits to her experiences at the Woodson Art Museum. 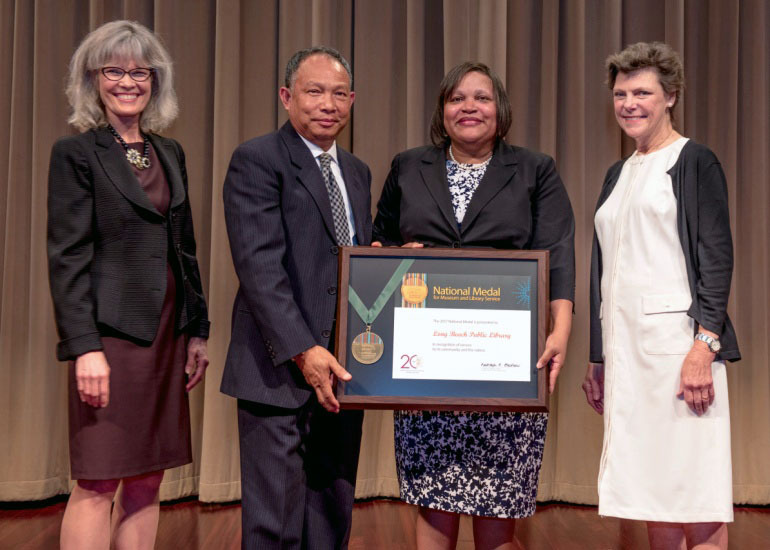 Long Beach Public Library Director Glenda Williams, and community member Bryant Ben accept the National Medal for Museum and Library Service from Institute of Museum and Library Services Director, Dr. Kathryn K. Matthew, (left) and journalist Cokie Roberts (right). Photo Credit: Gediyon Kifle. For over 100 years, California’s Long Beach Public Library has worked to meet the informational needs of its culturally diverse and changing population. The staff focuses on serving area residents by playing an active role as a community partner, addressing issues facing their patrons beyond the library. When the library’s Mark Twain branch was built in 2006, residents were asked for input on library programs and services. Cambodian refugee Bryant Ben jumped at the chance to help shape library programs and encouraged his fellow community members to do so as well. He began teaching free Khmer classes at the branch and also volunteered to help the library digitize Cambodian collections so that the immigrants could feel a sense of home. He continues to be a library advocate and emphasizes its important role in the community. 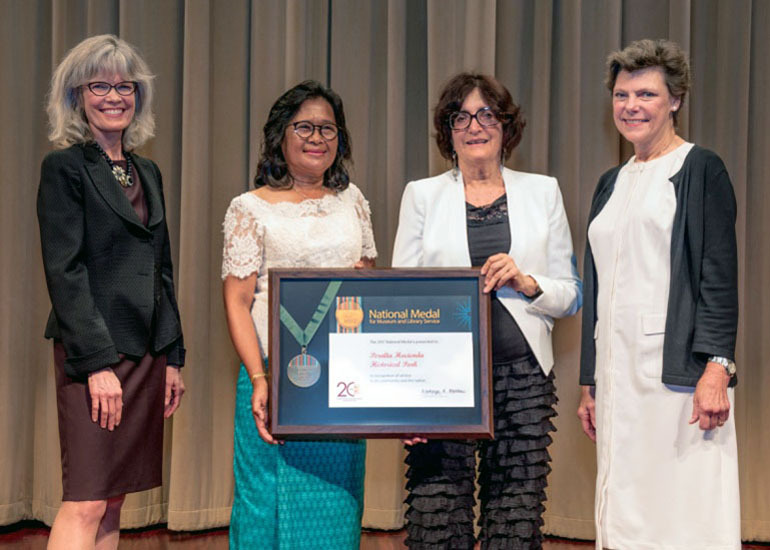 Institute of Museum and Library Services Director, Dr. Kathryn K. Matthew, (left) and journalist Cokie Roberts (right) present the National Medal for Museum and Library Service to Peralta Hacienda Historical Park’s Executive Director Holly Alonso (third from left) and community member Sambo Ly (second from left). Photo Credit: Gediyon Kifle. Located in the Fruitvale Community of Oakland, California, Peralta Hacienda Historical Park tells the stories of the extraordinary community it serves. Fruitvale community member Sambo Ly, who first arrived in the United States after escaping the refugee camps of Thailand and the Philippines, benefitted from the park’s cultural exhibits and activities. Ly’s experience with the park immediately gave her a sense of community that she lost when she came to the U.S. She has found that the park’s exhibits allow her to share about her suffering in Cambodia, which culminated in her autobiography, All I Heard Was My Sorrow. Ly now hosts Cambodian events, giving her a chance to honor her Cambodian roots by celebrating the art, dance, music, and traditional games that were forbidden during the Khmer Rouge era. 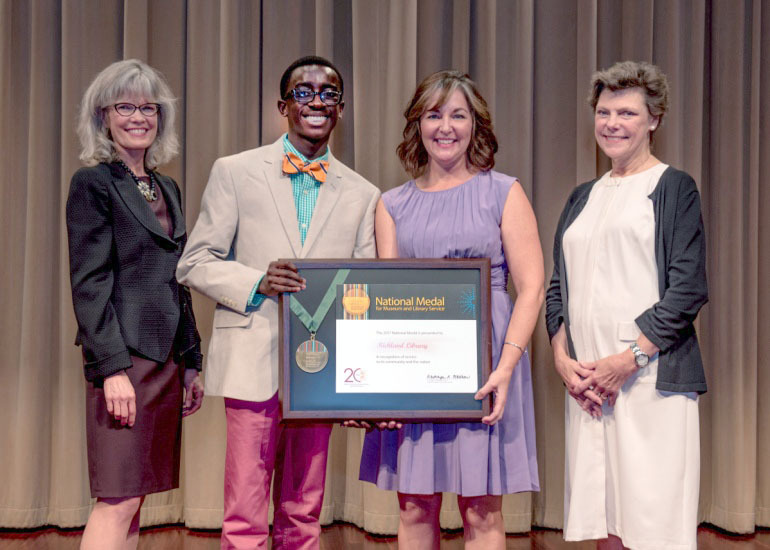 Melanie Huggins, executive director of Richland Library, (second from right) and community member Josiah Washington (second from left) celebrate after accepting the National Medal for Museum and Library Service from Institute of Museum and Library Services Director, Dr. Kathryn K. Matthew, (left) and journalist Cokie Roberts (right). Photo Credit: Gediyon Kifle. Richland Library of Columbia, South Carolina, has redefined what it means to be a library, focusing its business and outreach strategies on strengthening the lives of the people it touches. The institution’s human-centric approach to programming and services boldly answers the many needs of its patrons. Community member Josiah Washington grew up at the Richland Library, a place he credits with fostering his passion for learning and his keen sense of curiosity. His family says his love of books and knowledge ultimately led him to compete and win on the television game show Jeopardy when he was twelve years old. Now seventeen, Josiah volunteers at the library, giving back to an organization that continues to provide meaning and value to his life. 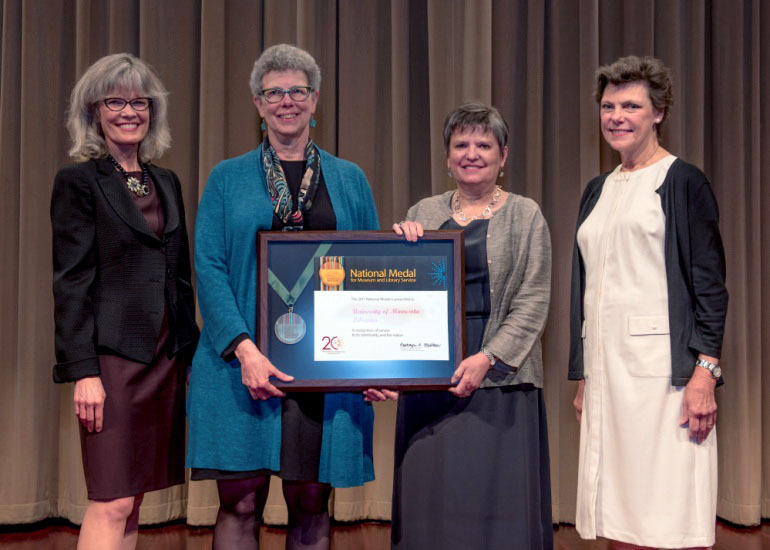 Institute of Museum and Library Services Director, Dr. Kathryn K. Matthew, (left) and journalist Cokie Roberts (right) congratulate representatives from the University of Minnesota Library, Wendy Pradt Lougee, university librarian and McKnight Presidential Professor at the University of Minnesota Libraries, (third from left) and community member Jennifer Gunn (second from left), after receiving the National Medal for Museum and Library Service. Photo Credit: Gediyon Kifle. The University of Minnesota Libraries in Minneapolis-St. Paul, Minnesota, prides itself on serving a “cascading community” of diverse groups of people. As Minnesota’s only research library, it champions statewide access to research materials while also taking on the responsibilities of a comprehensive research institution that is open and responsive to all who visit. University professor and library advocate Jennifer Gunn, Ph.D., uses the libraries’ special collections to emphasize the critical importance of using primary sources in research when interpreting history. In all her work with the libraries, Dr. Gunn continues to be impressed by the meaningful interactions librarians have with undergraduate and graduate students alike. 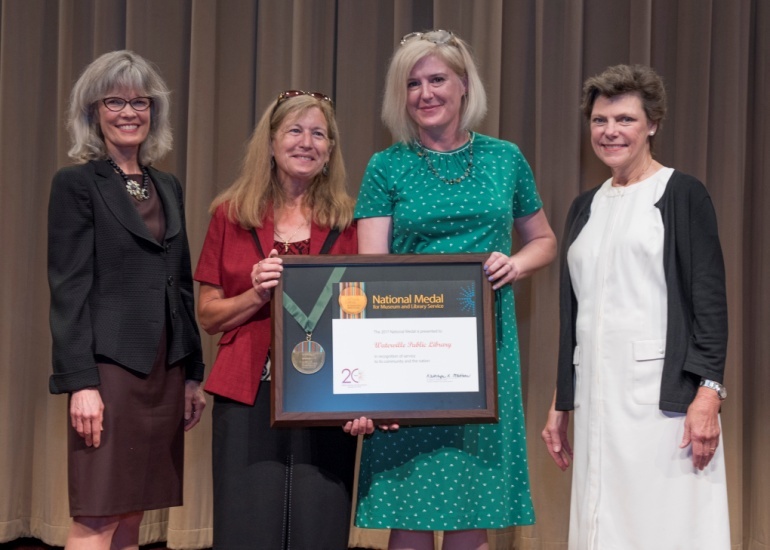 Institute of Museum and Library Services Director, Dr. Kathryn K. Matthew, (left) and journalist Cokie Roberts (right) present the National Medal for Museum and Library Service to Waterville Public Library at the National Archives. Sarah Sugden, director of the Waterville Public Library, (third from left) and community member Eve Sotiriou (second from left), accepted the award on behalf of the library. Photo Credit: Gediyon Kifle. Waterville Public Library in Maine is a small, but fiercely active institution that serves a town of 15,000 people. The library is committed to being a “wide-awake” institution, sensitive to the community needs for greater employment opportunities and cultural experiences. The library has also evolved into a safe space for many community members, like Eve Sotiriou. When Sotiriou and her son moved to Waterville, escaping an unsafe home situation, they discovered the Waterville Public Library, where Sotiriou says she felt instantly welcomed. Within days, Sotiriou used library resources to fine-tune her resume, look for employment opportunities, and provide her son with a place where he could devour books. Sotiriou now volunteers with the library, where she hopes to give back to the place that made her feel safe, loved, and supported at a time when she needed it most.